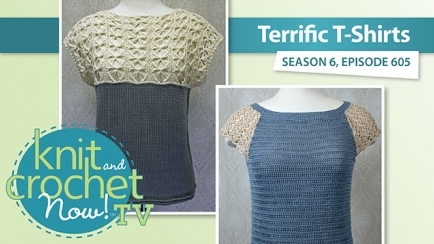 Robyn shows how to crochet her Raglan Lace Tee, and Lena knits up the Butterfly Tee. 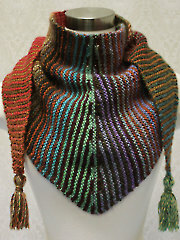 This week’s scarf is the knit Stripes and Short Rows Scarf. 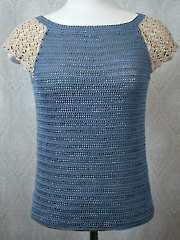 I don't really know how to knit, but I want to learn so I can make this butterfly tee. I am so excited and glad I signed up for this. The sleeves on the raglan tee are exactly what I was looking for to add to my tank tops. I can't wear tank tops at work so I decided to add some sleeves to them so I can wear them and this lace sleeve is perfect. Thank you so much! I love it. I can't wait to watch more videos. I cannot find the "Lace Sleeve Diagram Stitch". Could you please indicate where I can find it and print it. Thank you. 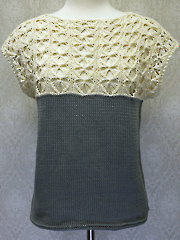 Denyse - Here's a link to the Raglan Lace Tee pattern. I'm really looking forward to trying both these cute sweaters. I've used thread a few times but never for a complete sweater. I downloaded the raglan lace tee pattern and reviewed it, but it doesn't contain the diagram for the sleeve mentioned in the video. I'd love to know where to get it. I'll definitely be back to view this video again once I get started. These are a great help for learning new stitches. Thanks! Barbara Jo - We would like to find out more from you concerning your post. Someone from pattern services will be contacting you shortly to see what we can do to help.